...as data from the [International] Electricity System Operator clearly shows (sic), it’s nuclear and gas plants that are responsible for the lion’s share of increases. It is time for a refresher. Some background on the data I'll share. The 2015 Annual Report from the office of The Auditor General of Ontario included a chapter on "Electricity Power System Planning." The entire chapter contained a wealth of information and continues to be cited frequently, but for those chasing hard numbers one particular star of the work was a figure revealing the quantity, and cost, of generation from various sources, inclusive of not only the larger generators frequently reported by the IESO (the "I" is not for international, but it is the electricity system operator), but also the seldom reported distributed generation - which is where most solar exists. Breakdown of Generation Cost by Energy Sources for the years 2007, 2008, 2009, 2010, 2011, 2012, 2013 and 2015. The Breakdown for 2014, which was included in the Annual Report of the Auditor General of Ontario, is attached as reference. These are numbers honest people might agree on as a basis for arguments. I'll note in January 2016 I estimated figures for 2015 in Beyond expectedly high cost: 2015 Ontario Electricity Summary Part 3 - and these new figures don't change anything I wrote back then. But there are some points to re-emphasize based on the trend from 2007-2015. One immediate point is the many possible sane data-based claims do not include the, "nuclear and gas plants that are responsible for the lion’s share of increases," published on the public broadcaster's site. Nuclear does have the greatest dollar increase from 2007-2015, but it also has the highest growth in generation. The increase in solar is 77% of nuclear's increase, and the increased cost of wind is 70% nuclear's increase - so the combined impact is nearly 50% greater. The increased cost of generation from natural gas suppliers has risen less than either. Some costs have declined: coal and imports. I caution on performing complex calculations for coal, gas/oil, bioenergy and other categories. The primary reason is the notation that "other" includes "contingency support payments", which are significantly comprised of payments to keep coal generators in service (and perhaps oil and gas fueled Lennox). This grouping contains the benefits of the cost reductions from eliminating coal benefiting gas - but there's a good case to be made that most of the capacity built specifically to replace coal's reliability attributes was gas-fired. The instinct among most people is to calculate a rate per unit (I'll use dollars per megawatt-hour) to compare sources. I have done so, and additionally calculated the average annual increase, in rates over the 8 years. While stressing these calculations deserve a big asterisk and lengthy footnote on the impacts of things such as curtailment and capacity payments, the simple figures provide an interesting context for contemporary stories on the province's electricity sector. The only source of generation with a declining average cost per unit is imports. Unburdened by contracting this is one source that hasn't seen increasing generation. The government's recent actions in contracting from Quebec a fixed quantity of supply, at a fixed rate, is the opposite of data-driven policy. Another curiousity from looking at rates: nuclear increased at under 3% a year, while wind increased at over 6%. There is lots of room for interpretation, but no room for claiming increasing rates for nuclear supply, not renewables, have driven the large price increases of the past decade. Many might be surprised by the increased average unit cost of wind - although not those that read The diminishing value, and increasing costs, of wind and solar generation in Ontario on this site over 4 years ago. To explore the increase in wind cost a little further, let me first introduce data for 2016. I've estimated 2016 wind costs by adding the value of reported hourly wind generation at the Hourly Ontario Energy Price ($119.5 millions) to the wind portion of the global adjustment ($1.552 billion). Appending the 2016 calculations to the revealed 2007-2015 figures shows the expected result of a decrease in average value accompanied by an increase in average cost. 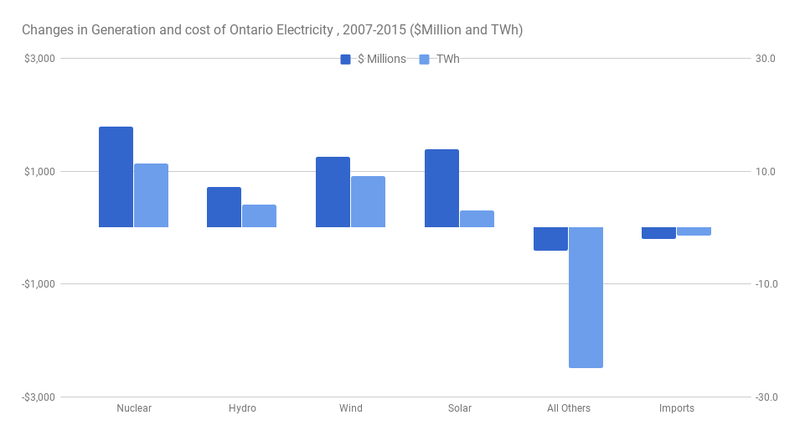 The future of Ontario's electricity supply is not as clear as it was when I started writing this blog nearing 7 years ago. It could be an exciting time as Ontario has minimal emissions during a period many jurisdictions claim to want low emissions - but it's hard to see how the general quality of conversation can improve when the mainstream media continues to muddle the basic facts. If the IESO is tracking embedded solar generation, why do they have no meaningful reporting of it's hourly output?